The idea is simple—a low-mass, low-energy vehicle powered by renewable energy and designed specifically for city mobility. 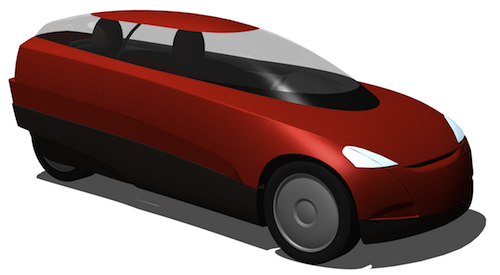 In 2003, the task of designing such a vehicle was given to industrial design students at the University of South Australia, led by an experienced automotive designer. At the same time, engineering students started designing the low-mass structures and the major components of the car. The design was further refined during 2004.
a tub chassis made from composite boards, formed by cutting, folding and gluing. In 2005 the car was built, painted green, and named “Trev”. 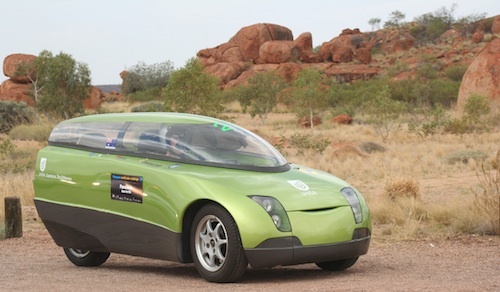 Trev was further refined during 2006, and in 2007 was driven 3000 km from Darwin to Adelaide in the demonstration class of the World Solar Challenge. Cruising speed was 80-90 km/h, range was up to 120 km, recharge time was one hour. Devil's Marbles, NT Australia, October 2005. Sounds FANTASTIC! I want one. are you going to produce the car for sale? Hope you acheive your aim. Have a great trip. At the moment if you want one you have to built it yourself. We will be putting instructions on Trevipedia (www.trevipedia.net). Our aim is not to build cars (we are a group of volunteers doing this in our spare time, and we do not have the time, skills or money to produce cars for sale); our aim is to inspire people to look for more efficient vehicles, and to inspire companies that know how to build things to build on our ideas and produce something appropriate for daily commuting. met you and your fantastic car in Linz (Austria) during the Zero Race. Good luck for the tour, I hope you will win with this great car! How much did that custom canopy cost to have made? Is there a high failure/reject rate in its production? The canopy was made for us by Ian Linke, a Team Trev member who has a business making sailplane canopies: Aviation Acrylic Mouldings. There is an article in AutoSpeed magazine explaining the process. This was the largest canopy Ian had built, and one of the first without a mould, so it took about three attempts to get it right. Production rejection rate 1 in 4 ish depending on what the fault may be . Sometimes the sheet will have a fault sometimes the tooling will do something unexpected , sometimes Ill mess something up. It is a big canopy and you need a big oven to do it successfully. We don’t use the wipers much, but the windscreen does scratch easily. After 27,000 km, it is due for a good polish. A cleaning system without a wiper would certainly be useful. Hope the team & TREV arrive safely at CASABLANCA & then GENEVA ! Thanks Henry. We have unloaded the cars and are on our way to Casablanca, to start the final leg. @teamtrev • Thanks for your kind answer & glad to hear that the cars have arrived safely and that you are on the way to Casa ! Louis mailed me mid of last week, as I had proposed to arrange something in GIBRALTAR with an friend of mine who the the European Member of Parliament for Gibraltar (& the south-west England… ): Graham WATSON MEP, LibDems UK. Louis wanted to call last week, but he must have been busy with the cars etc. Are there any plans for FRANCE yet? We had hosted the SOLARTAXI-crew for a few days, & arranged some events/media activities – and could again do so in (for example) Marseille, Lyon, Paris etc. Glad that there are enthusiast like you building out EVs that are small, light and efficient. One thing is when it comes to market, I hope that you will make it affordable to the masses. Too many such concepts become way to expensive that find no takers. Has Trev moved into retirement? Have followed the adventure since the early days, and admire the effort (both vehicle and website!). Are there any plans to follow it up? Looking to follow next year’s 2017 World Solar Race on the road. Trev has been taking it easy since being driven around the world. We have had some student projects that replaced a failed dash computer with a Raspberry Pi, and tidied up the motor control software. We still drive Trev to events (we did a hill-climb last year, as well as the usual science events and EV displays), and we get lots of school visits where we get the students to sit in Trev and push it around so that they can appreciate the benefits of a low-mass vehicle. We are currently finishing off our low-mass African Solar Taxi—a low-mass vehicle designed to transport pregnant women to hospital in rural Zimbabwe. The next World Solar Challenge should be interesting. I have heard that the number of Cruiser cars (solar cars designed to be practical as well as efficient) is continuing to grow.